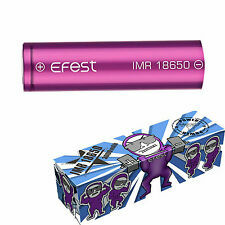 1 x EFEST Genuine IMR Battery 18650 3000mah Flattop 35Amp Anti Rip. Authorisation code: 69589462O44VLAO59. Keep safe always use genuine products. One efest battery (now supplied in a plastic case not the cardboard box). 2200mAh PCB battery Introductions 2200mAh Real High capacity design is durable and enduring. Actual Capacity 2200mAh. Subtible for 18650 batteries. Model 18650. 2X2200mAh PCB batteries. PCB Protected Board Yes. High Energy density, without PCB protection (safe chemistry) Low internal resistance & Excellent performance. Capacity : 2100 mAh. Point of this battery:PCB protected 18650 battery. (Other countries or remote areas may take longer.). Single LED Bulbs about 300-5000LM,Stable Performance, Perfect Lighting. We take joy in helping you get the gear you want at at the price you need! Feature: High energy density High working voltage for single battery cells. Long cycle life No memory effect Capacity,resistance,Voltage,platform time consistency is good. Good consistency.low self discharge. Light weight,small size This is a TR18650 Li-Ion battery rated at 3.7V 9900mAh. Generally an excellent quality, reliable Lithium 18650 battery that gives consistant great performance. Suitable for use in all types of portable devices and LED torches Specifications: Model: 18650 Voltage: 3.7V Capacity: 9900mAh recharging current: 1A Weight:35g Size:65x18mm . 2x SAMSUNG INR IMR 18650 30Q 3000mAh 15/30A 3.7v BATTERY VAPE. The Samsung 30Q 18650 is a high-quality battery & excellent value for money. Electronic E-cig Cigarettes Pen Vape batteries. Electronic E cig Cigarettes Pen Vape batteries. NOTE: This battery is a little longer than 18650 battery as pointed top, it is NOT suitable for ecig/vape, pls kindly note. Insert battery in right direction. Size: 69 x 18 mm. Keep in a dry and cool place. Type: li-ion Voltage: 3.7V size: 18mmx65mm Battery capacity: 2500mah Cell :Sanyo cell Biggest power of 2500 mah battery rechargeable high capacity 2500mah 18650 batteries providing much more power for devices Basic features: with overload protection function and discharge protection of devices, it is possible to use without concern exit at high and constant energy with great reliability and long shelf provides much longer time to run super capacity up to 2500mah, lasting protection of food and loss Note: Do not heat up the battery or the fire Avoid contact with the charger does not reverse Do not use mixed with different types of batteries Do not disassemble, crush, puncture, or short-circuit the external contacts Keep in a cool place, dry and keep out of the reach of children. These are fantastic 18650 cells. They have a huge 3.5aH capacity, one of the top values for any 18650 varieties. This will work in the vast majority of all products that use 18650 cells. Features: High capacity, no memory effect, durable to use. Built-in PCB protected circuit, with overcharge, over discharge, over current and short circuit protection, safe to use. Suitable for flashlight, torch, LED light, power bank, fishing head lamp, etc. Specifications: Color: Blue Battery Type: 18650 Li-Ion battery Battery Capacity: 2200mAh Voltage: 3.7V Dimension: About 68 x 18 mm / 2.68" x 0.71" Package Includes: 2 x 18650 Li-ion Battery Brand Unbranded MPN Does not apply EAN 4894663644680. Features: High capacity, no memory effect, durable to use. Built-in PCB protected circuit, with overcharge, over discharge, over current and short circuit protection, safe to use. Suitable for flashlight, torch, LED light, power bank, fishing head lamp, etc. Specifications: Color: Blue Battery Type: 18650 Li-Ion battery Battery Capacity: 2200mAh Voltage: 3.7V Dimension: About 68 x 18 mm / 2.68" x 0.71" Package Includes: 2 x 18650 Li-ion Battery Brand Unbranded MPN Does not apply EAN 4894663649043. · Nominal capacity: 3000mah. 18650 is a high quality battery & excellent value for money. High battery safety. Low battery internal impedance. 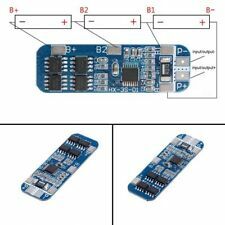 4S 20A 14.8V 16.8V Li-ion Lithium 18650 Battery BMS PCM Protection PCB Board ~! 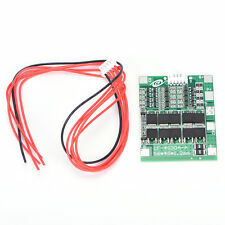 3S 12V Lithium 18650 Battery Cell BMS Charger PCB Protection Board 10A Li-ion.